Agilent Technologies now offers PXI-based and LXI-based 15-bit arbitrary waveform generators (AWGs) that can create simultaneous wide-bandwidth and high-resolution signals for electronic testing of radar, satellite, telecom or military communication equipment. Using 15-bit vertical resolution, the N6030A (PXI) and N8241A (LXI) products generate the most realistic wideband waveforms available in commercial AWGs. Spurious-free dynamic range is less than -65dBc for each channel, DC to 500MHz. Noise floor is less than -150dBc/Hz across the full channel bandwidth. 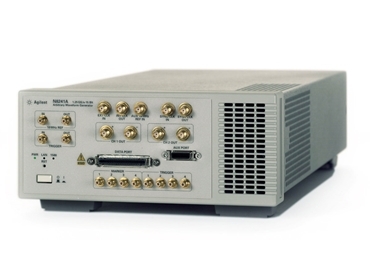 When combined with the Agilent PSG vector signal generator wideband I/Q upconverter, Agilent Technologies' AWGs can achieve modulation bandwidths of 1GHz at high frequency up to 44GHz for authentic signal simulations for IF and RF subsystem testing as well. The 4-slot PXI N6030A and the LXI N8241A feature two channels, each offering 1.25GS/s with up to 500MHz of signal bandwidth and a standard waveform length of 8MS per channel that is expandable to 16MS. The N8241A is also available with a 625MS/s sampling rate at up to 250MHz per channel. Dual output channels drive both single-ended and balanced designs without the need for balun or hybrid adapters in the test path. Advanced sequencing and extended waveform memory of the AWGs provide long scenario simulations for extended playback times. Multiple programming interfaces, such as the complete instrument control from MATLAB(r), enable easy integration into existing test environments as well as simplify waveform-development tasks.